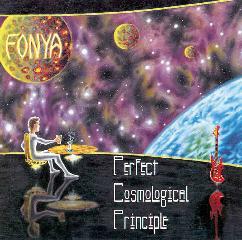 Fonya - "Pefect Cosmological Principle"
Fonya is a complete DIY effort by Colorado-based musician Chris Fournier (Get it? Fonya... Fournier?) who plays all instruments including guitars, bass, and a variety of keyboards. This is his fifth release. I wouldn't call Fonya's music SpaceRock. Its more symphonic progressive along the lines of Jeremy and other orchestral prog bands. However, his music has that magical quality that makes this mind expanding enough to be of interest to Aural Innovations readers. The all-instrumental music is keyboard dominated, but there are loads of electric and acoustic guitars that serve to embellish the songs with soaring Hackett influenced licks guaranteed to carry you away on a cloud. Sythesized flutes add to the classic progressive feel and the fullness of the sound makes this an impressive work for one musician. Images of medieval times are conjured up and if you close your eyes you'll get that feeling of elation that the "pompous" and "bombastic" heavies of the 70's served up so well. Chris has mentioned live performances so I gather he can do the octopus thing or has plans to put a band together. Despite my descriptions, in a live setting I think Fonya's music would fit in well with other space bands. Recommended to sympho proggers and spacers who like less than heavy space music. You can visit Fonya at his web site.